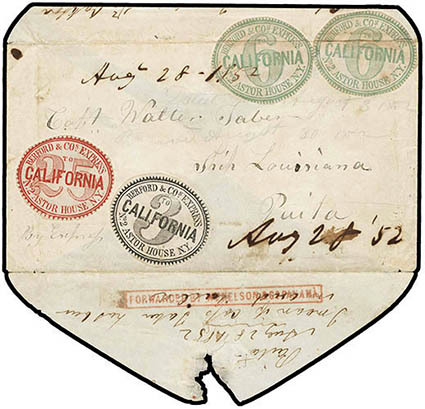 Adams & Co., printed Over Our California and Coast Routes frank at left on 3¢ red (U10) buff Nesbitt entire with manuscript "Don Pedro's Bar, Aug. 24th Cal." 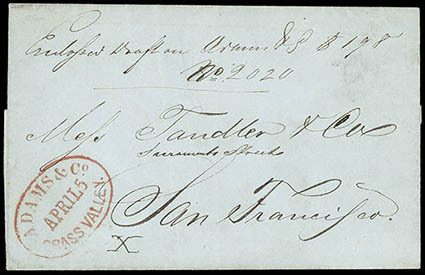 postmark to San Francisco Cal. ; backflap with some adhesive staining and couple tears, small edge tear at bottom, Very Fine, ex-Lyons. Thomas No. ADA-001a Estimate $3,000 - 4,000. ONE OF ONLY SEVEN RECORDED ADAMS & CO. PRINTED FRANKS, ONLY TWO OF WHICH ARE PRINTED AT THE LEFT SIDE. The Adams & Company's printed paid franks were produced in 1853, making them the earliest franks actually printed on envelopes or stamped entires. Their function was to facilitate the deposit of mail in letter boxes after the normal business hours of the express, or in lieu of waiting in line during normal hours similar to prestamped mail. There are a total of seven printed Adams & Co. franks in three slightly different formats on plain envelopes (two printed vertically at left), both stamped and stampless, and on the 3¢ Nesbitt entire. 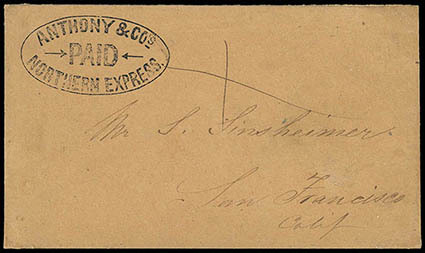 Adams & Co., Grass Valley, April 5, sharp strike of red oval datestamp on blue folded letter datelined "Grass Valley, April 4 1854" to Tandler & Co., San Francisco, endorsed as enclosing draft, Very Fine. Thomas No. ADA-101e Estimate $300 - 400. Adams & Co., Sacramento, Aug 11, blue double-circle datestamp on light buff cover to San Francisco Cal. with "Miner's Coat of Arms" illustrated Barber & Baker design showing miner and bear hold up cross with various miner implements; some edge tears and wear, Very Fine, ex-Dale-Lichtenstein. ONE OF THE FINEST OF ONLY TWELVE EXAMPLES OF THIS SCARCE DESIGN RECORDED BY KUTZ. Until its failure in the financial panic of February 1855, Adams & Co. Express was one of the largest and most successful express companies in California. One of its strongest hubs was Sacramento City. Anthony & Co's, Northern Express, Paid, wonderful strike of oval frank handstamp on orange buff cover to San Francisco Cal., pencil "X" marking, Very Fine and choice. Thomas No. ANT-100 Estimate $500 - 750. ONE OF ONLY THREE RECORDED USED EXAMPLES OF THE ANTHONY & CO'S NORTHERN EXPRESS OVAL. This express operated between San Francisco, Benicia, Sacramento and the Northern Mines. It had an office in Sacramento and may have carried the mail only as far as Marysville and Nevada City. 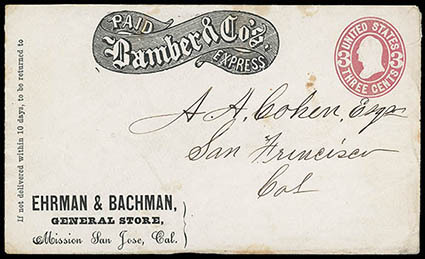 Bamber & Co's Express, printed ribbon frank on 3¢ pink (U58) entire to San Francisco Cal., printed "Ehrman & Bachman, General Store, Mission San Jose, Cal." corner card; small edge tear, Very Fine. By 1858, John J. Bamber had consolidated R.T. Lockwood's Contra Costa Express, W.F. Herre's Contra Costa Express and Hoag & Co. Express under the heading of Bamber & Co. and began operating throughout the eastern bay area of present day Alameda and Contra Costa Counties. He exchanged with Wells Fargo & Co. at San Francisco. Bamber & Co. sold out to Whitney & Co. on December 31, 1873. J. Bamber & Cos. Contra Costa Express, W.K. 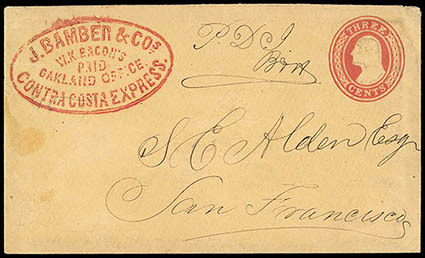 Bacon's, Oakland Office, Paid, bold strike of oval handstamp on 3¢ red (U10) buff Nesbitt entire to San Francisco Cal., endorsed "P.D.G., B & H"; some edge wear, Very Fine, WC0980. Thomas No. BAM-105 Estimate $400 - 600. ONE OF ONLY THREE RECORDED EXAMPLES OF THIS J. BAMBER & CO. OAKLAND OFFICE OVAL. 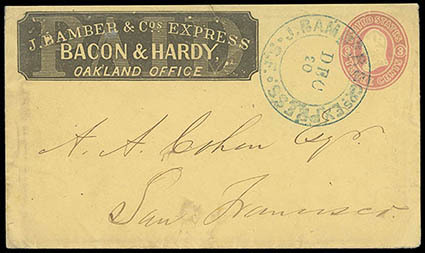 J. Bamber & Cos. Express, Bacon & Hardy, Oakland Office, shaded frank on 3¢ pink (U35) buff entire cancelled by blue J. Bamber & Cos. Express, S.F., Dec 20" double-circle datestamp to San Francisco; small edge tear and no flap, Very Fine. Thomas No. BAM-005 Estimate $200 - 300. Bamber & Co's Express, printed frank at left of legal-size 12¢ lake & brown on buff (U42a) mint entire, Very Fine. Scott No. U42a; $1,250 Estimate $300 - 400. Berford & Co.'s Express, 1851, 3¢ black, 6¢ green, 25¢ red, one 3¢ black, two 6¢ green singles and one 25¢ red, each cut to oval shape, used to pay 40¢ rate on cover from New York N.Y. addressed to "Capt. 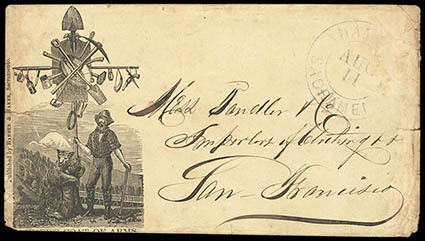 Walter Taber, Ship Louisiana, Paita", endorsed "By Express" at lower left, faint pencil docketing on front "Dated August 3, 1852, Received August 30, 1852", cover originated in New York City and was sent by Berford's to Panama where red "Forwarded By Wm. Nelson & Co. Panama" forwarding agent's framed handstamp was applied on backflap, docketed "Augt. 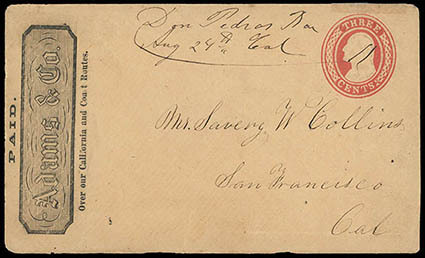 28, 1852" twice on front, once tying a 6¢ stamp, note on reverse in same hand reads "If not in Tambez [Tumbes, Peru] Dr. Oakford will please return this pr first opprty & oblige. Yours truly, A Bathurst, Paita, Aug. 28, 1852, I mean if Cap. Taber has been in and sailed", based on pencil Aug. 30 receipt notation on front, the letter reached Captain Taber in Tumbes; flaps opened and top refolded to flatten both 6c stamps that were affixed over top edge, Fine, ex-Chapman, Mason, Horner, Golden and "DK"; with 1983 and 1999 P.F. certificates. Scott No. 11L1, 11L2 (2), 11L4 Estimate $50,000 - 75,000. A REMARKABLE THREE-VALUE BERFORD & CO EXPRESS FRANKING FOR THE 40¢ RATE TO THE WEST COAST OF SOUTH AMERICA. THIS IS THE ONLY RECORDED USE OF THE 25¢ STAMP, OF WHICH ONLY TWO STAMPS ARE KNOWN. Richard G. Berford and Loring L. Lombard operated the Berford & Co. letter-carrying business beginning in 1851. Berford & Co.'s Express primarily served the West Coast of North, Central and South America, but also advertised rates to Hawaii, Hong Kong and China. Although their letter and package express business was fairly large, the adhesive stamps for letter mail are rare. During the course of their operation, there were several bitter clashes with the government over their mail route. They sold out to Wells Fargo & Co. in June 1854. There are only a handful of Berford & Co's Express stamps recorded for any value. There are four 3¢ (11L1) stamps recorded (two off-cover and two on-cover including the one offered here), seven 6¢ (11L2) and two 25¢ (11L4), there are only two recorded: one uncancelled off cover, ex Caspary, Lilly and Hall, and the stamp on this cover. Four covers are recorded with Berford & Co. stamps paying the 40c rate from New York to the West Coast of South America. Berford's June 17th 1851 advertisement in the New York Herald announced the "New Postage Law" and included a "Table of Postage" listing this 40¢ prepaid rate to the west coast of South America. In the advertisement, the stamps (3¢, 10¢ and 25¢) are described and various rates are given effective July 1, 1851. Obviously, Berford's was acting in response to the U.S. government postage reforms of the same date. The Louisiana noted in the address is probably the 1,056-ton screw-vessel registered in 1850 at New York City. 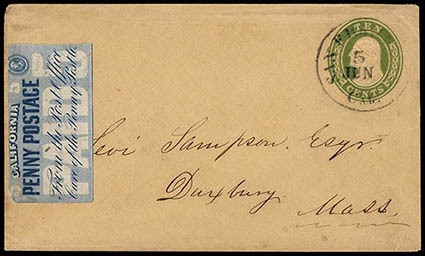 California Penny Post Co., 1855, 5¢ blue, usual close-cut margins to slightly in at top, uncancelled with small flaws and tiny ink mark, affixed on 10¢ green (U18) buff entire cancelled by "San Francisco Cal. 5 Jun" cds to Duxbury Mass., Very Fine, ex-Kuphal, Lyons; with 2015 P.F. certificate. Scott No. 34L4 Estimate $5,000 - 7,500. AN EXCEPTIONALLY RARE USE OF THE CALIFORNIA PENNY POST CO. 5¢ BLUE STAMP ON A 10¢ GREEN ENTIRE. The 34L4 stamp is cataloged by Scott in combination with a 10¢ #14 stamp at $55,000. It is not listed on a 10¢ Nesbitt entire.